← Ever wanted to be a zombie? When the Four Horsemen launched their Kickstarter, they had six birds ready to go - the raven, of course, but also five others. Four of them were normal birds, but the final one was a joke, a gimmick, a wink and a nod to the fans: Minotaur the Duck. 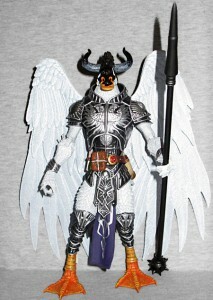 The first FANtastic Exclusive toy was Xetheus, Champion of Mynothecea, and he was joined by the Minotaur Soldiers. This duck is, for some reason, wearing a war helmet like the ones the soldiers wore. It's not the same design (since it needs to fit over a duck's bill, not a bovine muzzle), and the horns are part of the armor, not a natural anatomical feature, but this is still a cool homage to the line's origins. He has a bright red scar over his left eye, and there are matching cuts in the metal of his mask. 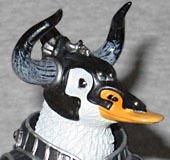 Minotaur the Duck's armor is dark grey with silver outlines, and his loincloth is indigo. If you want to buy the add-on wings, he'll take a set of white. He has the same weapon as the other variant birds - a staff with the spiked mace head on one end, and a sharp spike on the other - but it's dark grey instead of gold, to further set him apart from the crowd. 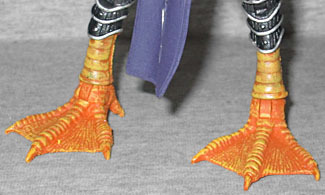 And because he's a duck, the Horsemen also designed new feet for him. In addition to the standard three sets that all the other birds have, he also gets a fourth pair that are webbed. How awesome! 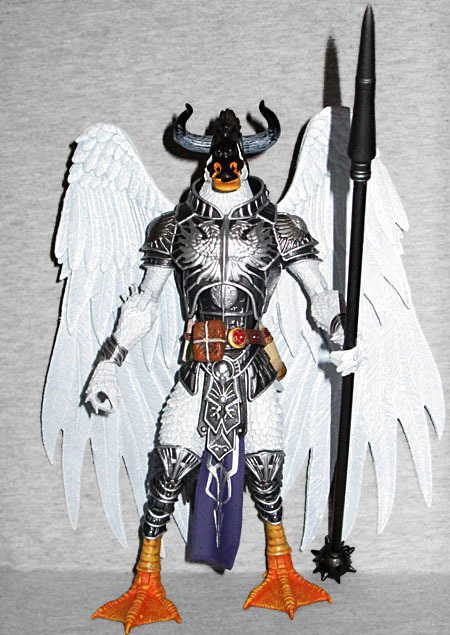 While the other dozen birds can all be purchased from the Four Horsemen's web store, Minotaur the Duck is a Kickstarter exclusive, meaning he was only available as a reward for backers. He's definitely worth it for longtime FANtastic Exclusive fans. This entry was posted in blog exclusive review, FANtastic Exclusive, Kickstarter and tagged Gothitropolis, Seventh Kingdom. Bookmark the permalink. You do know that these are all sold out right? Saying they can be purchased is a bit of a kick to the junk when you click the link and none are available for sale. Sold out *for now*. They didn't destroy the molds when they were done with them, and the ravens have clearly been a hit, so once they finally get everything sent out (they're still working on international orders), they'll be able to figure out what they need for a second production run. The next series of birds - now part of Mythic Legions, rather than Gothitropolis - will be going up for pre-order on Store Horsemen next Friday, November 6. There will be 13 of them, and if you order the whole set, there will be a discount. PLUS, the most popular of the Gothitropolis birds will be available for preorder, so this is everyone's chance to catch up on the feathered friends. Be interesting to see what variants appear, seeing as we've already seen a possible parrrot.